Can You Place a Baby Internationally from the US? If you are pregnant and considering placing a child for adoption, there are several decisions to make: what kind of family you hope to have for your child; your relationship with the prospective adoptive parents; whether you want a closed, open, or semi-open adoption; and, yes, even the location of the prospective adoptive parents. So what if a birth mother wants to place a baby internationally from the United States? Intercountry adoptions have taken place in the United States for over 60 years. At the height of international adoption, in 2004, 22,989 children were adopted from foreign countries and came to live in the United States. Different decades have seen different country trends, from Russia to South Korea and from Guatemala to China to India. Through it all, the United States was and has remained one of the largest receiving countries in intercountry adoption. But the U.S. is also a large sending country. According to U.S. law, birth mothers may choose whichever adoptive family they feel is right for their child. Whether that family resides in Paris, Texas, or Paris, France, is completely up to you. Should you feel your child would have a better future in another country, here are a few tips. To begin with, the United States is a Hague Convention country. The U.S. entered the Hague Convention in 2008 as a way to safeguard all intercountry adoptions. 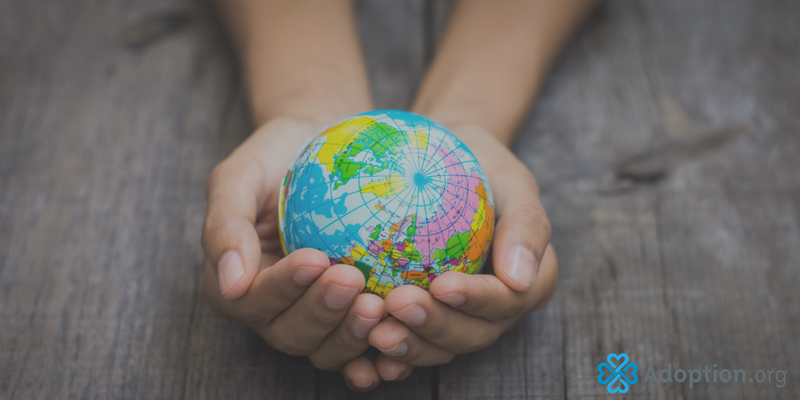 As a Hague Convention country, the U.S. can only send adoptees to other Hague Convention countries, a complete list of which can be found here. The largest receiving countries of U.S. adoptees are Canada, Britain, and the Netherlands, all of which are Hague Convention countries. In some, such as Canada, your child may be able to maintain dual citizenship. Intercountry adoption is governed by the laws of both the sending country (where the child was born) and the receiving country (where the child will live with their adoptive parents). As the U.S. is a Hague Convention country, there are certain processes that must be adhered to in order to place a baby internationally. Prospective adoptive parents must complete a home study, pass fingerprinting and security clearances, be between the ages of 30 and 50, and in some cases meet financial and health requirements. For birth mothers, because of the complexities involved, it is best to work with an accredited adoption agency rather than pursue a private adoption. After matching, the process of intercountry adoption is somewhat similar to domestic in that upon delivery, state law prevails. In California, for example, it will take six months to finalize the adoption, whereas in Texas it will only take 90 days. It’s important to note, however, that due to the complexities of intercountry adoption, the location of the birth mother and the location of the prospective adoptive parents may dictate elements of both the legal and the adoption process. The good news is that agencies trained in intercountry adoption will be able to guide you through this process. Because the U.S. is a Hague Convention country, you must use Hague-accredited adoption service providers. A full list can be found at the Council on Accreditation. Find more information on international adoption here, or visit Adoption.com’s photolisting site for children who are in need of homes. Find out how you can adopt a child now.